October saw the publication of the Michaelmas Term edition of the Battersea Grammar School magazine. 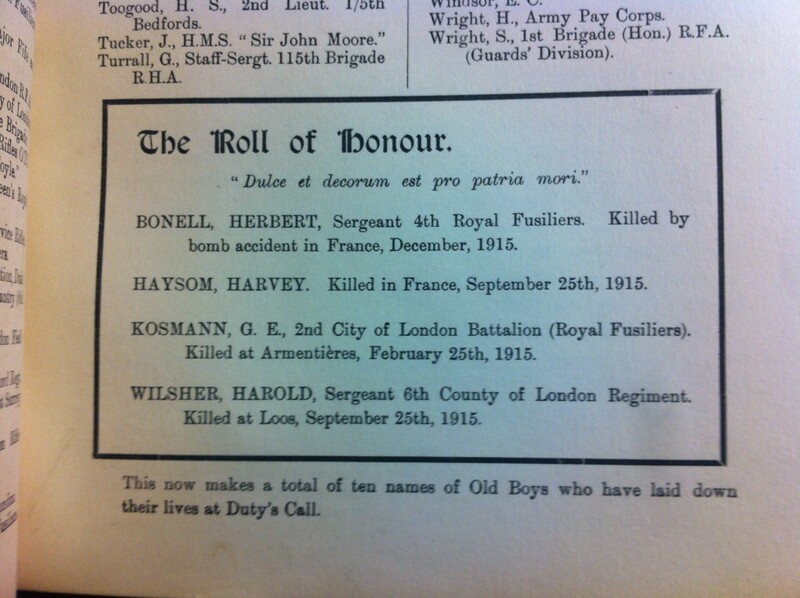 The magazine contains the usual mix of school and Old Boy news, demonstrating that some aspects of life carried on unchanged by the war, whilst others were more affected. …a large proportion of our Sixth Form boys, instead of spending about two years longer with us, have either joined the army, or taken up work in which their scientific and other knowledge could be turned to immediate use. We congratulate them on their patriotism, and are thankful that, notwithstanding this depletion, the total number of boys in the School has been well-maintained. He also refers to a former Captain of the school who had recently obtained a commission in the Second 5th Yorkshires and to a large number of others who had joined the army – there were plans to publish a list in the next edition. A former master – A C Martin – had also gained a commission in the Royal Field Artillery. The House Notes section of the magazine shows areas which were less affected – mainly the reports of sporting achievement. Bolingbroke house felt that they’d had a good cricket season, despite their Juniors losing all their matches, as the Senior team beat both St John’s and Trinity. St John’s did not feel they’d done so well in the cricket, although did note that they had been Champion House at the athletic sports this year and that they had put forward the largest number of entries in the Swimming Sports. It had obviously been a good year for Spencer – they did not lose a match in either cricket or football all year, and came top in the Swimming Sports as well. 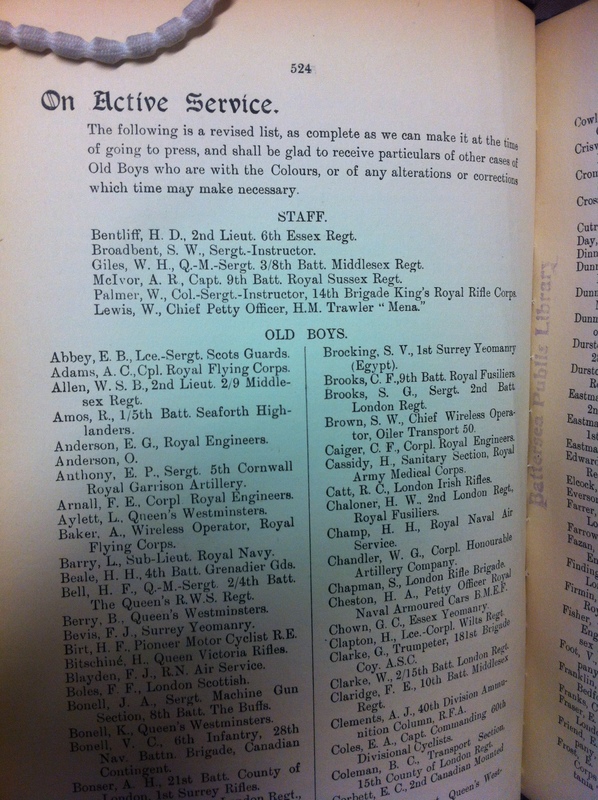 Trinity house had unexpectedly lost both their Captain and Vice-Captain at the time of the magazine, presumably some of those who had joined up rather than stay on at school, as the report refers to their late Captain, W G Game, having got his commission in the Yorkshire Regiment following training in the London University Officers Training Corps. The losses made it difficult for them to record how cricket and football had gone, but they could report on reasonable success in Swimming, coming second in the team race. W Game makes a further appearance later in the magazine, writing about his experiences of an OTC training camp with the London University OTC. It’s a fairly light-hearted account, including reference to making “the acquaintance of a few interesting NCO’s who, among other things, will introduce you to a new feature of military life, viz, its phraseology” and an account of the perils of kit inspection and the difficulties of getting buttons to shine as they should. His is not the only account of life in the Forces, two other old Boys had also written back to the school to update them on their experiences. Captain Henry Inman had spent some years with the Civil Service on leaving school, then returned to the UK and immediately joined up, his letters refer to his experiences in the Dardanelles – although by the time the magazine was published he had been invalided home, possibly suffering from shell-shock. There were also extracts from letters written by Robert H Maddocks, in France with the 15th London Regiment, including notes on using a table found in a ruined house and finishing “our rum, into which I put some café au lait”. 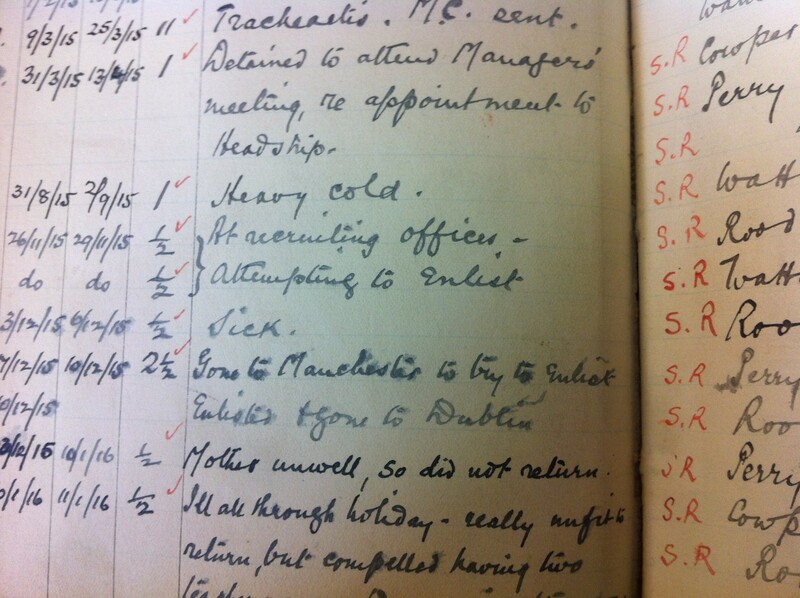 On 21st August the school log book for Holy Trinity School in Upper Tooting records that the older girls in the school had been allowed to continue knitting socks for those at the Front instead of taking part in the General Knowledge lesson. Presumably this was part of encouraging everyone to be a part of the war effort – the older girls in the school were Standard 6 and 7, meaning they were aged 11 or 12. 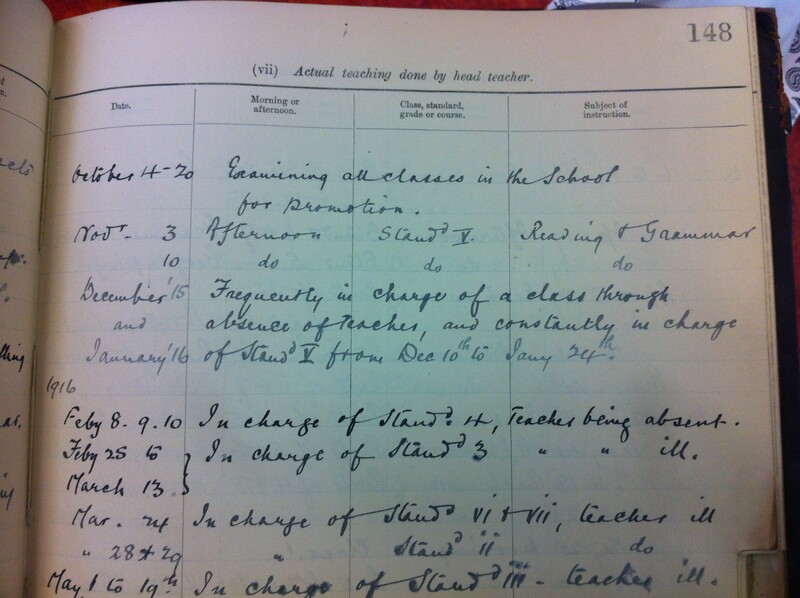 School was actually supposed to start back this week – term was meant to begin on the 24th but the London County Council brought the start of term forward to the 12th due to the outbreak of war. The log book for the 12th records that several of the older girls had started to knit, and a few weeks later on 9th October records that most girls were still knitting and up to present had knitted 32 pairs of socks and 15 pairs of bedsocks. 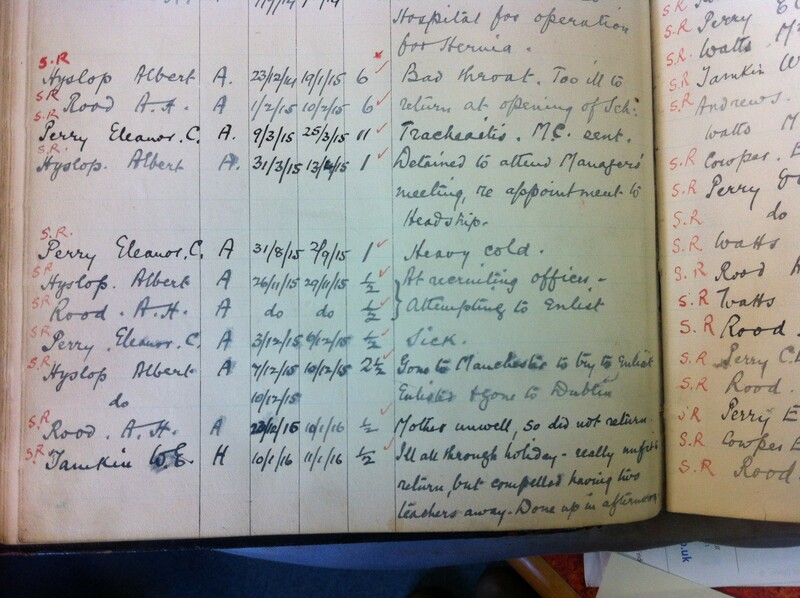 Sadly the log book does not give any more figures on socks after that, so the total of socks knitted by the girls of Holy Trinity School during the war is unknown. Holy Trinity School log book, reference: S12/2/5 School log books are like diaries of what was happening in the school. We hold school records for Church of England schools in the borough, London School Board records can usually be found at London Metropolitan Archives. Patterns for First World War era socks seem to be widely available online, for anyone who would like to try knitting some!